Sourav Ganguly is a difficult icon. He is undoubtedly one of India's most successful captains, one who moulded a new team when India was at its lowest ebb, reeling from the betting scandal. There can be no argument about his cricketing genius, right from the time he scored a Test century at Lord's to the time he led India to the 2003 World Cup final. But the world of cricketing fans is divided into those who adore him fiercely and despise him greatly. He could be arrogant on occasion: Ganguly allegedly refused to carry the drinks as a twelfth man. He constantly challenged authority. Greg Chappell discarded him from the team during his stint as coach. Ganguly cared little for convention: remember the bare-chested celebration at an Indian win? Yet, in all the years of his roller-coaster ride through Indian cricket, no one questioned the man's utter devotion to the game or his team. In this account of one of India's greatest cricketers, shot through with intimate details, Saptarshi Sarkar tackles controversies around the legendary cricketer head on. 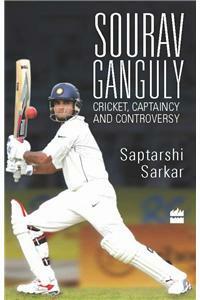 Racy and gripping, Sourav Ganguly: Cricket, Captaincy and Controversy investigates the big events in Dada's interesting career. It probes the symbiotic relationship between the man and the cricketer. What was Ganguly thinking before a match? Why did he demand that the grass be trimmed just before start of play at the Nagpur pitch? What was the Indian dressing room like? What was that Greg Chappell chapter all about? An unflinching biography of a man who never shied away from controversies, this is as much a ready reckoner for Sourav Ganguly fans as it is an examination of a crucial era in Indian cricket. id he demand that the grass be trimmed just before start of play at the Nagpur pitch? What was the Indian dressing room like? What was that Greg Chappell chapter all about?